These hardware parts hold the panels together and allow for their proper movement during opening and closing. The ones at the sides of the door house the roller stems. It is important to check the hinges for damage and wearing. The cylinders should be perfectly round. If they are oblong, this indicates that they are worn and should be changed. If the hinges are bent, they should be repaired or replaced. Any loose ones require tightening. It is important to replace damaged and missing bolts right away. 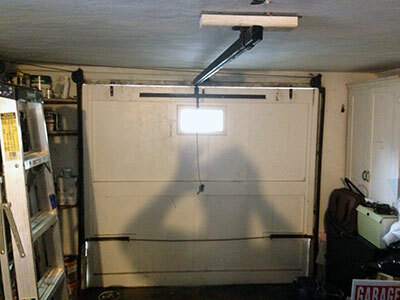 The hinges require lubrication as part of annual garage door maintenance. The product used for the job should be approved or recommended by the door’s manufacturer. One of the key factors for successful lubrication is to run the door a few times so that the product can spread properly. It should start with inspection of the wiring, rail, drive and trolley. If any of these parts is damaged, it should be fixed or replaced. The safety sensors require cleaning with soft lint-free cloth. They should be aimed at each other so that they are connected with a beam of infrared light for detecting passing objects. The sensors require testing too. An object is set in front of one sensor while the door is open. When closing starts, the door must reverse immediately. If it doesn’t, the devices have to be fixed or replaced. Chain and screw drive openers require lubrication. Lubricant should be applied to the chain or screw shaft and to the sections where there is friction between the trolley and the rail.